In Warrenton, Missouri, about an hour outside St. Louis, a hoosier torch is about to be passed. 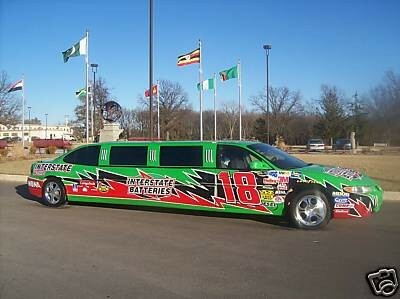 The old Interstate Batteries Limousine is for sale. With seven days to go as of this writing, the 1999 Pontiac Grand Prix GT is going for $11,500. And where can you buy it? Ebay, of course. 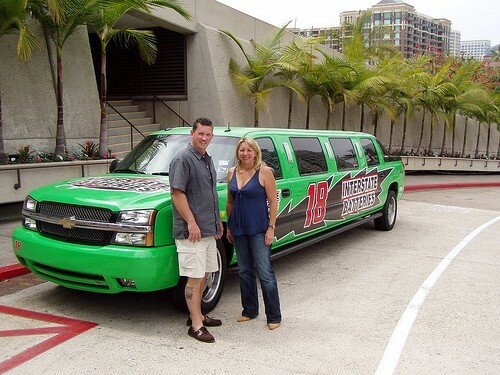 It's been featured in commercials and promotional events for the company over the years -- here's a commercial from 2001 that features this neon green bean. This thing is conspicuous, extravagant, and although it's only a V-6, I'm sure it makes up for astronomical horsepower with this sweet interior: Luxuries include air-conditioning, power windows, cruise control, power locks, TV's, some sort of bar and two-tone seats (unsure on if it's leather or vinyl.) The eBay description identifies it as the second-most photographed car in the world, right behind the Presidential State Car, though it's unclear if that's referring to all the presidents combined, or just the new guy. In short, this car is totally awesome and worth all your money. Looks like now is the time to get bidding on this beast, just in time for all those spring weddings and proms.